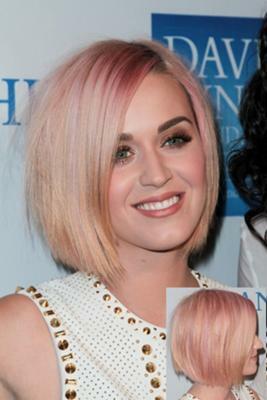 Straight chin-length bob hair style with blunt cut. Golden and white blond hair color with hint of faded pink. Match your eye makeup to pink palette such as Frosty White Pink, Bright frosty pink, Dirty violet and Blackened plum and you get yourself a complete new look for a night out. Return to Bob Hair Styles.